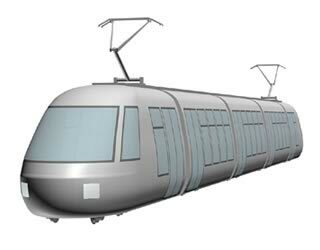 Rapid visible progress is being made on the construction of Stadtbahn Glattal. A visit to the Hallenstadion area yesterday revealed that rails have been installed alongside this building. The connecting points to the city tram system have also been installed but are not yet connected to the other new track. At the other end of the new track, the rails stop just short of the railway bridge, but resume on the other side ending short of the Hagenholzstr junction. At least one of the overhead masts has already been planted (and has a working streetlight). At Hallenstadion the inbound platform and shelter have already been built. The shelter is larger than those in the city and is built to a high standard with architectural accents that will be repeated throughout the Stadtbahn Glattal project. Advertising posters are already installed in the shelter and are lit up! Stadtbahn Glattal is a project to bring trams to an area to the North of Zürich. The first phase (now under construction) will see tram route 11 extended from Messe/Hallenstadion to Auzelg using 2.7km of new track and serving five new stops. This section will open in December 2006. Further phases will see lines to the airport and Stettbach. This news item is from the 2005 newslog.